Synopsis: Unlock new information about your favourite characters from the Harry Potter movies with this definitive coffeetable book profiling the good, the bad, and everything in between within the Harry Potter universe. Dive into the personal journeys of beloved Harry Potter heroes, and an insightful look at the motivations and actions of the films’ most notorious and complicated villains. Concept art, behind-the-scenes imagery, and film stills track everyone from Harry, Hermione, and Ron to Dobby, Mad-Eye Moody, and Dolores Umbridge, telling their complete stories as they evolve throughout the film series. 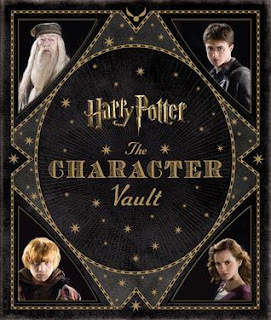 A comprehensive collection of the movies’ beloved characters, this beautifully designed book is the ultimate Harry Potter character overview. This, like its predecessor, is a JOY of a book. I have a special things for concept art and this hits me up in all kinds of ways. I can just sit and stare at the pages of and pages if it. Ohhh those pictures of Voldermort (bet you never thought a sentence like that would ever be uttered), they're beautiful! It is a fantastically colourful book, full of images, sketches concept art and information about characters we all know and love. That's maybe the one gripe that can be said about these books, is that we already know a lot of information (depending on the die hard nature of your fan-ness), but it is actually really nice to have it all in one place and when there's such a wealth included you'll be finding out things you never knew and adding more and more dimention to the world that we all feel such a part of. I said I would keep it short. Basically this book is one that has to be experienced. I would wax lyrical about it all day but you need to experience it yourself to fully appreciate it...so go appreciate it! HOANG QUAN cung cap dich vu cho thue xe 7 cho uy tín nhat ha noi.